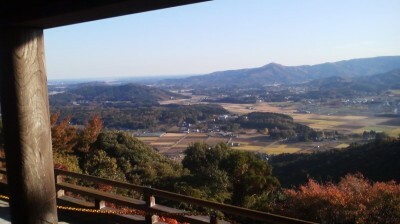 On November 12th, the governor of Ibaraki Prefecture and the mayors of both Tsuchiura and Ishioka Cities, along with sundry National and Prefectural Diet members and city-council members, gathered at what had until that day been one of the most peaceful and isolated spots in the Tsukuba area (though it is in fact in Tsuchiura)- the Ono District, in what was once Niihari Village. At 3 PM, to the accompaniment of a brass band and in front of as small contigent from the regional and local media, these prominent cogs in the political machinery of this area cut the ribbon at the entrance Japan`s latest engineering feat- the Asahi Toneru ( Asahi tunnel), which at 1.784 meters is now the longest in the prefecture. Though construction began in 2008, the project was first put into action way back in 1996, and now finally- 16 years and 5.5 billion Yen later, the tunnel has been opened connecting the Tsuchiura/Tsukuba side of the Asahi pass with the Yasato (Ishioka City) side. This will save drivers who used to use the old road over the Ashahi Pass between Tsukuba and Yasato a total of 15-20 minutes each way. Now that might not sound like very much, but that old road ( which of course still exists) is a narrow, winding, even treacherous mountain road and the journey across the pass using it seems like MUCH more than 15-20 minutes, especially on icy or foggy days when it would IN FACT take much longer. So while I would still recommend using that old winding road over the pass if you are out for a scenic ( and hair-raising) drive on a nice day, I would surely urge you to use the tunnel if you have some activites planned in Yasato (or beyond). 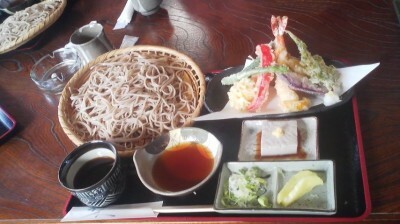 In fact the other day, a friend of mine suggested a lunch-time trip to a soba restaurant she liked in Yasato. Before the tunnel was opened this would have been out of the question. But after meeting at the parking lot of the Oho Branch of the City Office ( near the High Energy Physics Laboratory) we were at the restaurant in Yasato in 15 minutes! It took about 3 minutes to pass through the beautiful brand-new (though narrow, at only two lanes) tunnel. Getting to the tunnel is easy for those living or working in Tsukuba. Just keep going straight heading east on Nishi-Odori even after you pass the McDonalds outlet on the corner where it meets Higashi-Odori (or turn to the east at the same corner if you are on Higashi Odori). The roads from then on is known as Rt. 53. You will soon leave the Science City portion of Tsukuba City and enter its more unchanged areas. The twin peaks of Mt. Tsukuba will be far to the left, and at 1o o`clock (as a direction) you will see a lower mountain ( with a tower on top), which is Mt Ho-kyo-Zan. At the foot of that mountain, in what is now the old neighborhood of Oda, long stood the great Oda Castle (小田城). And by long, I mean very long- from the 12th century to the end of the 16th century the Oda Family ruled here, and at that time the area was replete with large and influential temples ( you will be surprised to know that this was the only family in all of Japan to stay in power for that entire period!) It was between 1339 and 1343 at Oda Castle ( of which virtually nothing besides the moats remain recognizeable today) that the scholar, courtier, scholar, warrior and supporter of the Southern Court KITABATAKE CHIKAFUSA (北畠親房, 1293-1354) wrote his highly influential tract- the JINNO-SHO-TO-KI (神皇正統記), in which he asserted that Japan is the Land of the Gods (KAMI NO KUNI) because it has been continuously ruled over by one Imperial Family- an idea taken up with enthusiasm by the Mito Clan, then later by those who supported the restoration of the Emperor in the second half of the 19th century, and then by most of the general public (until the end of WWII). Straight ahead will be a more unsightly scene- a mountain half eaten away. This is a quarry. As you cross the major intersection at Rt 125 (with a gas station across the road on the left, you will keep going straight on RT. 53. On weekdays I would recommend that you close your windows here because this portion of the road in heavily trafficked with trucks loaded with gravel or other construction materials, The local people call this segment of the road DUMP TRUNK ALLEY (DAMPU KAIDO).Sundays should be more pleasant Even with the windows closed you will probably be able to hear the shots being fired at the firing range on the left. When you turn to the left you will immediately notice that the road forks. The older, narrower road veering left will take you to TO-JOJI. 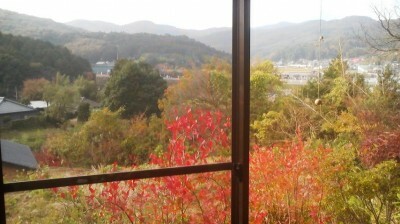 But if you head there, you would not make it to the tunnel (TO-JOJI and its surroundings are an excursion in itself!). Anyway, as you drive to the right, on the nice, new road you can have a look at the mountain slopes on the left and contemplate how this basin which time seems to have forgotten was once an important religious center. Follow the signs to the Flower Park. But now we are heading towards the tunnel brand new, it almost seems to sparkle, even in its dark interior. With only one lane going each way, it too can be a little nerve-racking for those unaccustomed to tunnels. But soon you will emerge ( in about 3 minutes as I have mentioned already), and when you do burst out into the light, it seems as if you have travelled very far indeed, to a part of Ibaraki which has not seen any of the development which Tsukuba has experienced. It is also a more mountainous landscape than on the southern side of Mt. Tsukuba (which might be why the Yamato Court originally placed the regional capital in what is now Ishioka- these people usually chose to settle in basins (BONCHI,盆地) surrounded by low mountains. You will be greeted by banners advertizing orchards which offer fruit picking ( right now it would be for mikan oranges, apples and persimons). 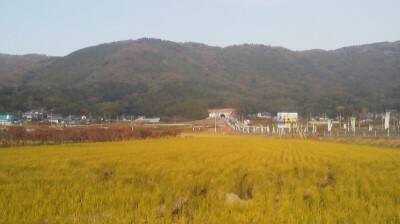 Yasato is famous for this and this area is part of what is called the FRUITS LINE. What makes your fruit picking ( and eating while you pick) unusual in this area is that while you are among the trees with clippers and basket in hand, above you there will most likely (on weekends) be scores of paragliders and hangliders soaring above and around you- because Yasato is a major center for these sports. (I recently picked MIKAN at the SUGITA KANKOU KAJU EN (杉田観光果樹園) which was VERY friendly and will still have mikan (and persimons) to be picked for a couple of more weeks. It is located on Rt.7, on your right hand side after turning left off the main road. Most of the other orchards are located nearer to the tunnel, on Rts 42 and 150- also after having made a left off the main road). 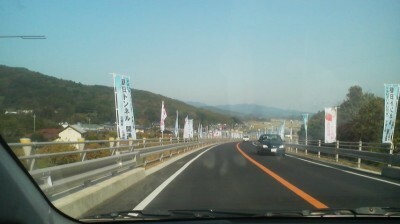 But YASATO, which became part of Ishioka City in 2005, is alot more than fruit. It was the presence of the Yamato court was felt very early in this part of the prefecture (with Imperial forces arrival by watercraft via what is now called Lake Kasumigaura. There are some impressive archaeological ruins in the area- especially the burial mounds of these early strongmen ( one is said to be the first son of the Emperor Sujin). The great Priest Shinran (the founder of the Jodo-Shinshu Sect of Buddhism- the most popular in Japan), passed through this area and there are many local legends associated with him. There is also a tiny Tendai Sect temple which is well worth a visit, as it resembles the famous Kiyomizu Temple in Kyoto ( that city`s most popular sightseeing spot), and affords beautiful views of the surrounding area on fine days. It is said to have been founded in the year 807 by the priest Tokuitsu ( the same man who founded the temple half-way up Mt. Tsukuba which is now the Tsukuba-San Jinja). You cannot enter the temple`s hall- just sit on its deck and enjoy the great view (if you have small children with you be extra careful with them here as there is no fencing to stop a very precipitous fall to the valley below. 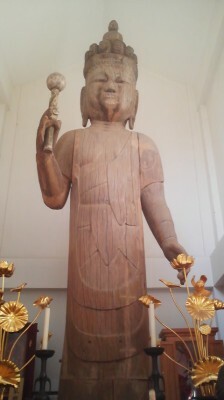 Besides the temple`s main hall (held up precariously by posts you will also want to take pause to admire a large wooden Buddha image (VERY unusual in these parts) and an enormous and very old tree ( a SUDAJI-). There are two ways up to the temple, which is about 10 km from the tunnel – on a long and winding moutain road. I guess I would recommend going up one and down the other. showing why he is considered one of the mouth-pieces of the REVERE THE EMPEROR, EXPEL THE BARBARIANS (sonno jo-i) Movement, which was spawned and flourished in this part of Japan ( remember how I have already talked about the works of KITABATAKE CHIKAFUSA, and his work written at nearby Oda Castle). 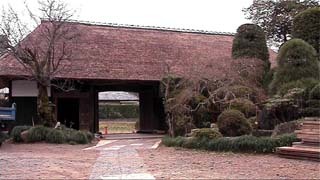 There is , by the way, the ruin of a castle connected with Oda Jo located in Yasato. This fortress was called the Kakioka Castle and was first built by the 8th son of the founder of Oda Castle (and the founder of the local dynasty). Besides all these sopts of historical interest there is the Guitar Museum and the Flower Park (which is very near the tunnel but has a 700 Yen entrance fee for adults!). 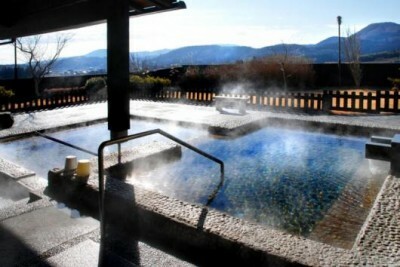 And if all this fruit picking and sight-seeing gets you feeling tired and sore you can always soothe your muscles at the YURI NO SATO hot Spring Facility (which can now be visited conveniently from central Tsukuba – about 30 minutes each way from Tsukuba University or KEK). And as for lunch, the soba restaurant my friend took me to was quite good, with nice views- though the service on that day was VERY slow. 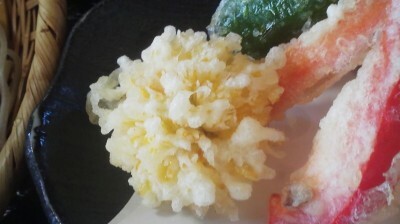 The tempura was especially delicious (and interesting). The place is called MAI IE まいいえ. The tempura- soba set (made with spring water from Mt. Gassan in Yamagata Prefecture) costs 1,500 Yen. The restaurant is located only a minute from the Yasaka entrance to the tunnel. It is on the hill to the right. I cannot explain exactly how to get there now, but just above this restaurant is a large wooden chalet like house. Head for that. If you can`t find it, no worries. There are other soba (and other types of eateries) along the main road. Being such a mountainous country which is also so heavily ROADED and RAILROADED, it is only natural that Japan has so many tunnels, SOmetimes, though it gets ridiculous. 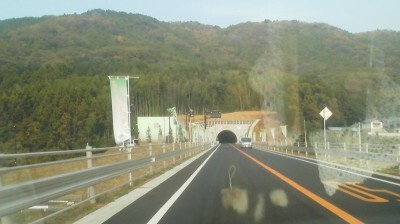 The worst tunnel related experience I had was in Iwate Prefecture. I made a special trip to that areas SANRIKU KAIGAN COAST which I had heard was so spectacular ( though later utterly devasted by the tsunami of 2011). I was also told to take the SANRIKU RAILROAD to enjoy the trip. Much to my surprise ( and chagrin) I found that most of the trains route was inside tunnels- with only quick flashes of a view. It was TUNNELTUNNELTUNNELTUNNEL view TUNNELTUNNELTUNNELTUNNEL view! Ridicuolus! I am also a bit worried that that beautiful part of Tsuchiura, near the tunnels mouth, that part of this area that time had forgotten will be ruined by more construction and a proliferation of convenience stores and gas stations. Lets hope it doesn`t happen. and just a parting word…. when it comes to day trips in Japan, don`t restrict yourself to Tokyo, or other famous spots like Nikko or Kamakura or even Mt Tsukuba.. Get over your TUNNEL VISION! Head to the tunnel and explore the OTHER less travelled side of the mountain.